How to Convert Password Protected PDF Documents? ”I have got a PDF file and I want to use my PDF converter to convert it to Microsoft Word document. But my PDF converter failed to convert this PDF file because I was told that the PDF is protected by password protection. I need to remove the password protection before I can convert it to Word file. Does anybody know how to deal with such PDF file with encryption? Thank you for any suggestion.” - Question from Yahoo Answer. We can not convert password protected PDF files to other file formats unless we can get a professional PDF password remover tool to decrypt the PDF. Here in this article, we are going to recommend Coolmuster PDF Password Remover, a well-reviewed PDF tool that enables users to remove both owner and user passwords from PDF with original PDF formatting and layout fully preserved in the output file. If you are a Mac user, we have PDF Password Remover for Mac designed for you. Try the free trial version of the PDF Password Remover and then follow the 3 detailed steps below to see how to use it to convert encrypted PDF. Install and launch the PDF Password Remover. Import the password protected PDF file into the program by clicking the Add Files button. Batch removing PDF security is supported that you can directly drag and drop as many PDFs as you have to the app. - If a small lock appears on the PDF list, it means the PDF is protected by an user/open password. You need to enter the right open password to unlock the PDF. - If there is no lock appears, it means the PDF is protected by an owner password and the program will decrypt it directly. - If you see a cross icon, it means the PDF is not supported by this program. Specify a destination to save the output files by clicking the Browse button on the bottom of the program. And then click the Start button to remove the password protection from the encrypted PDF. 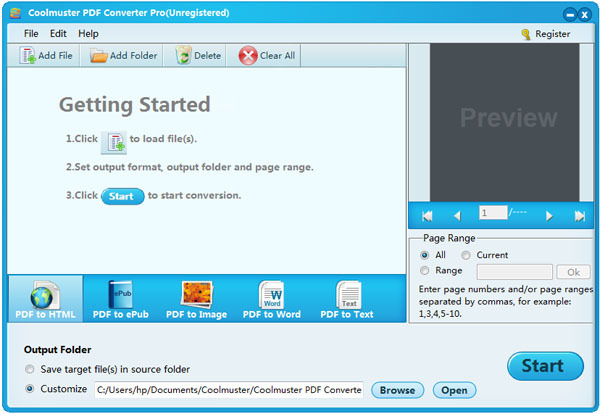 If you have PDF conversion software already installed on your computer, you can import the PDF output from above step into the PDF converter to begin the PDF conversion.